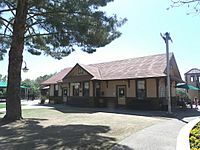 The Aguila Depot, built in 1907 by the Santa Fe, Prescott and Phoenix Railway and moved to the McCormick-Stillman Railroad Park in Scottsdale, Arizona. As of the census of 2010, there were 798 people residing in the CDP. The population density was 508.1 people per square mile. The racial makeup of the CDP was 64.66% White, 1.00% Black or African American, 3.63% Native American, 0.38% Asian, 0.25% Pacific Islander, 28.07% from other races, and 2.01% from two or more races. 69.42% of the population were Hispanic or Latino of any race. This area has a large amount of sunshine year round due to its stable descending air and high pressure. According to the Köppen Climate Classification system, Aguila has a mild desert climate, abbreviated "Bwh" on climate maps. 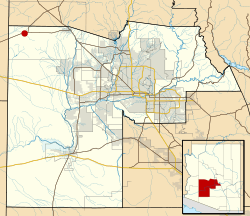 Aguila, Arizona Facts for Kids. Kiddle Encyclopedia.